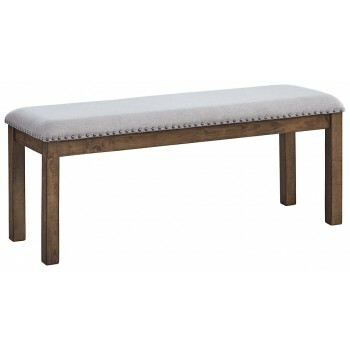 This upholstered dining bench elevates the art of casual rustic style. With a distressed nutmeg finish, antiqued nailhead trim and textured polyester fabric, this upholstered dining bench entices with warmth and earthy elegance. Cushioned seat accommodates lingering meals enjoyed in comfort.